My love of pink is by no means a secret. Gimme all the blush, all the rose, all the mauve, all the fuschia. Any tone, any shade, I’m sold. 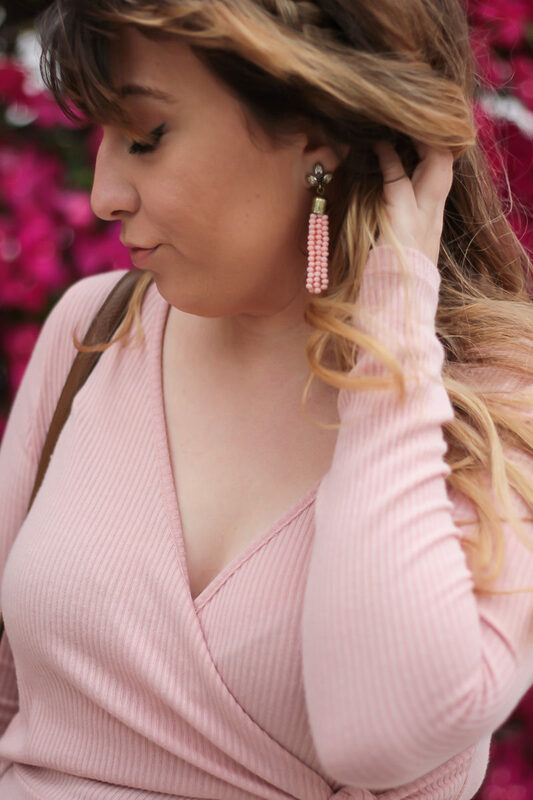 Blush tones have really been having a moment lately and I’m fully on board. March means spring and spring means pretty little dresses, at least in my book. I’ve said it a million times, I’d rather wear a dress than jeans any day of the week. (Just me??) But, the caveat to that is that I’d rather wear a COMFORTABLE dress than jeans any day of the week. I love a good swing dress or an easy knit and this faux wrap dress fits the bill. It’s $45 and available in 4 colors; blush, maroon, black and white. ALL the colors are amazing and at $45 I’d recommend scooping up more than one. A wrap style is super flattering on all body types. If you’re curvy, it accentuates all the right curves. If you don’t have any, it creates the illusion of some 😉 This soft and light knit transitions really well into spring.